An organization that has received funding from liberal billionaire George Soros is pushing anti-Donald Trump student protests that call for sanctuary campuses to protect undocumented students. Thousands of students at more than 80 college campuses have participated in "sanctuary campus" protests, CBS News reported. Students have signed petitions and walked out of classes at their universities "in support of undocumented classmates." The protests are billed as though they are being organized by students at the grassroots level, but in fact a D.C.-based immigration activist group is behind them. United We Dream is the "largest immigrant youth-led organization in the nation," composed of over 100,000 immigrant youth and 55 affiliate organizations in 26 states, according to its website. The group seeks to "organize and advocate for the dignity and fair treatment of immigrant youth and families, regardless of immigration status." The group issued a "state of resilience and urgency for immigrants" on Nov. 9, the day after Trump’s victory over Hillary Clinton. "The most contentious election in a generation is over. Across the country, immigrant youth in orange shirts, and backed by the strength of their convictions, faced the racism of Trump head on in a fight for their lives," the press release stated. "Immigrants are declaring a state of urgency and resilience. Over the coming weeks, our families and community members will need to tap into the incredible strength that brought us to this country and which we use to survive," said Cristina Jimenez, the executive director and co-founder of United We Dream. "This is a time to mobilize in every city state across our country," Jimenez later added in the release. "We calling on all people to take action to demand that their mayors and governors declare their cities and states as spaces of safety." United We Dream has received tens of thousands of dollars from George Soros' Open Society Foundations. Unbound Philanthropy, a private grant-making foundation focusing on migrants and refugees, and a handful of other liberal grant-making organizations have also funded the United We Dream Network since 2009. Taryn Higashi, the executive director of Unbound Philanthropy, sits on an advisory board of Soros's Open Society Foundations. United We Dream has teamed up with Voto Latino, a non-profit organization that "empowers" American latinos, on the campus protests. Actress Rosario Dawson is cofounder and chairwoman of Voto Latino. "Donald Trump began his campaign disparaging immigrants, calling for mass deportations, and now has confirmed his plans to immediately deport 2-3 million people," said Maria Teresa Kumar, president and CEO of Voto Latino. "We call on all young people to organize with us in our college campuses and on social media in our community’s fight for justice and dignity, to keep our community informed and to provide immigrant youth and their families protection from deportation and separation." Voto Latino tweeted about sanctuary campuses on Nov. 16. "We look forward to our campus chapters organizing & pushing their schools to become sanctuary campuses! ‪#HereToStay," the tweet said. The tweet linked to an article about universities facing pressure to become immigrant sanctuaries. The groups have launched a MoveOn petition calling for sanctuary cities that will be delivered to mayors across the United States. It has garnered more than 100,000 signatures. United We Dream also followed Trump around the campaign trail. 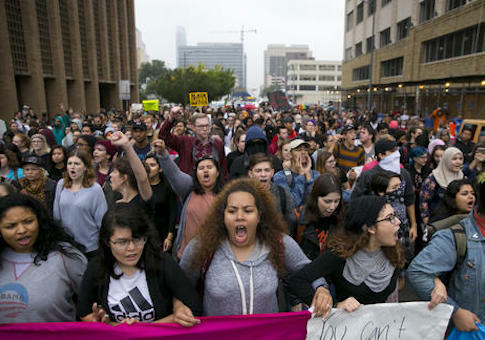 United We Dream did not return a request for comment on its involvement in the campus protests. This entry was posted in Politics and tagged 2016 Election, Donald Trump, George Soros. Bookmark the permalink.